Slips, Trips and Fractured Hips has been written for older people and all those caring for them, supported by RoSPA and AGE UK. Written by an experienced nurse and first aid expert, packed full of real life experience and sound advice; this book is designed to help you take measures to avoid injuries and equip you with the necessary first aid skills should an accident occur. Enabling people to remain safe, healthy and independent, reducing the incidence of admission to hospital from avoidable causes. It is designed to help you take measures to prevent life-threatening injuries and help you plan, prepare and avoid mishap. It will also equip you with the necessary skills should an accident occur. Immediate and appropriate first aid saves lives, reduces pain and suffering and can make a dramatic difference to the speed and extent of the casualty’s recovery. First aid treatment can be so simple and knowing what to do can save people so much pain, scarring and further major hospital intervention. Supported by RoSPA, Home Safety and Age UK advisers, Slips, Trips and Fractured Hips is packed full of practical hints and tips relevant to people as they get older. As we get older our physiology changes and we often develop additional medical conditions. These conditions and the medicine taken to manage them can alter the way our bodies react to injury. Understanding this is key to managing a first aid emergency in an older person and anticipating how they might react to the injuries you can see. Staying one step ahead in an emergency situation often proves vital to the recovery of the casualty. As we age, we also become more accident prone. Our eyesight deteriorates, our skin becomes more friable, we may develop medical conditions which affect our balance and mobility and generally we become more susceptible to injury. It is vital that we recognise this and take extra steps to keep ourselves fit and healthy and are mindful of common avoidable hazards that frequently lead to accidental injury. Older people can suffer serious injuries from falls, bleeds and burns that would be superficial in a younger person. They may not respond to a medical emergency in the usual way and can deteriorate extremely quickly. It is important to recognise and understand that the physiology in older people is different and that medication may affect this too. 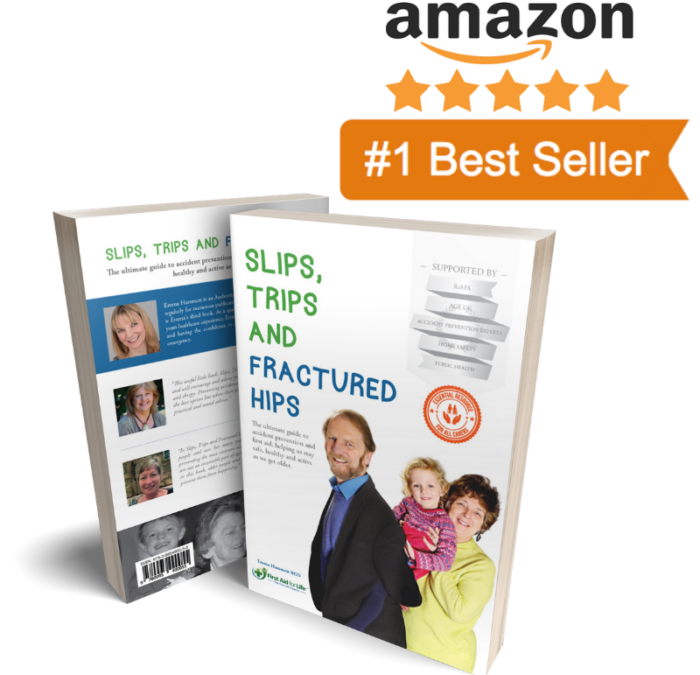 Slips, Trips and Fractured Hips includes an overview as to how the ageing process affects us physiologically and an introduction to common medication and how this may affect the way people react in a medical emergency. Experienced nurse, trainer and first aid expert Emma Hammett draws upon her professional and personal experience to provide an engaging and authoritative guide to preventing and treating accidents. With clear, simple directions, tested advice, engaging photographs and illustrations, this a unique, must-have for all older people and anyone caring for them too.